Imagine eyewear so versatile that shifting from office wear to outdoors is seamless. With Progear’s new line of active eyewear, you can look as stylish at the gym as you do at work without ever changing your eyewear. Perfect for nearly all types of casual, non-contact sports, the Progear Optical Collection offers smart styling suitable for both work and play. Enjoy the convenience of leaving work and heading straight for tennis, jogging, yoga, cycling or any other mobile activity. No matter what you’re engaged in, moving from work-to-play or play-to-work has never looked better. Designed With Style and Comfort. Innovative headband interface (patent-pending) secures frame during light sports. Integrated earphone cable holder (patent-pending) provides slick management of hanging cable during sports. 3 frame constructions: compression mount rimless, full metal rim and nylon half-eye in stainless steel with nickel-free coatings. 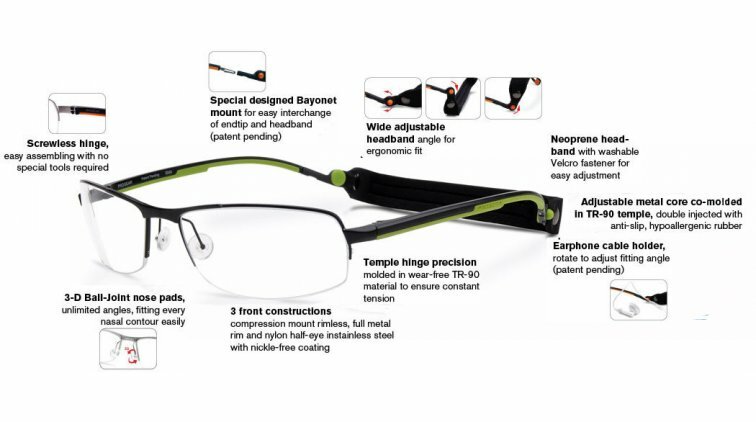 Lightweight frames with 3-D ball-joint nose pads for ultimate ergonomic fit. Screwless hinge allows easy servicing and carefree maintenance. Flexible TR90 temples with adjustable ear-loop, co-moulded with anti-slip rubber. 9 frame styles in both 6 and 8 base-curves (sports wrap), fitting every face form. Supplied with interchangeable head-band, EVA sports case and micro-fibre cleaning cloth. Safest Sports Eyewear Ever Created. - Less risk – more fun! polycarbonate and includes special lens mounts within each frame. Around 95% of our movements are controlled by vision. Those who can see well while playing sports will be able to react more quickly, move more confidently and will better appreciate situations therefore avoiding dangerous accidents. 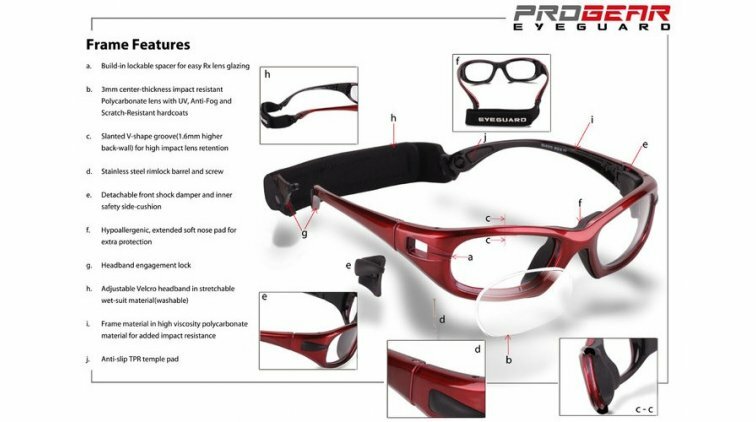 PROGEAR Eyeguard sports eyewear offers a wide field of vision and lenses can be custom fit with personal prescriptions. There are many reasons why PROGEAR Eyeguard fits so flawlessly. From the interior cushion and nose pads to the flexible headband mount, every detail ensures an accurate fit and comfortable wear. The combination of excellent materials, meticulous workmanship and a cool design makes PROGEAR Eyeguard sports eyewear feel all-around safe and comfortable. PROGEAR Eyeguard comes in 3 sizes, EG-S1010 (Size 48 18) for kids; EG-M1020 (Size 52 18) for juniors and ladies; EG-L1030 (Size 55 19) for adults. Each size frame has its own 4 unique and age-relevant colours.